MyGet Enterprise contains everything MyGet has to offer, hosted on a dedicated URL for your team. It comes with an additional management dashboard that can be used to manage everything related to the team such as feeds, users, quota, account policies and so forth. This page describes the available management options that are available to administrators of the Enterprise account. 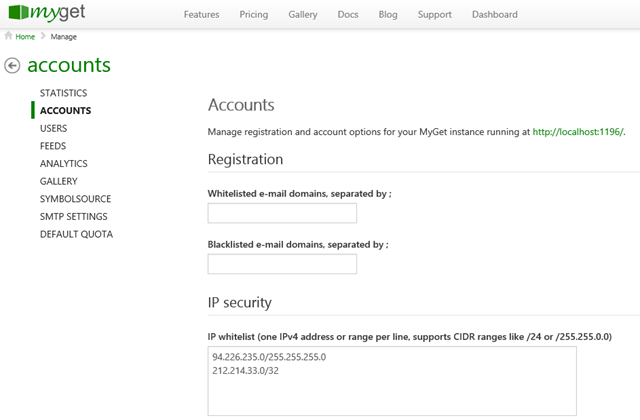 The general page allows setting the name for the MyGet Enterprise plan, as well as the logo displayed in the top navigation bar. The accounts page allows setting account options, such as whitelisted/blacklisted domains, IP security, password policies and so forth. The registration section can be used to whitelist/blacklist e-mail domains. For example, a whitelist can be set to acmecompany.com to only allow users from that domain to register an account. MyGet Enterprise makes it possible to whitelist IP addresses (or IP ranges) so only clients can only access MyGet if they are coming from the configured address. The whitelist will be applied for accessing the website, as well as for consuming hosted NuGet feeds. IP addresses can be entered on separate lines. If an entire subnet has to have access, the IP address can be suffixed with a CIDR suffix (e.g. /24) or a subnet mask (e.g. /255.255.255.0). The Registration and Login section provides a means of customizing user registration and login. The text that is shown on the login page (above username/password). For example, a notice could be added on who to contact to get an account. User registration can be disabled so that Enterprise administrators always have to invite users to the MyGet Enterprise plan. The passwords section enables specifying minimum password length as well as policies such as how many lowercase, uppercase, numeric and special characters should be in a password. The lockout section provides options to lock a user account after a number of login attempts. For example if 3 login attempts fail over a course of 10 minutes, the account can be locked out for a given duration. By default, MyGet closes sessions after 2 hours. If it is required to close a session after a shorter time period, it can be specified here. Many teams use this feature to logout users after, for example, 15 minutes of inactivity. Creating feeds can be limited to Enterprise administrators/feed creators. When enabled, non-administrative users will see a message that they should contact an Enterprise administrator in order to create a feed. 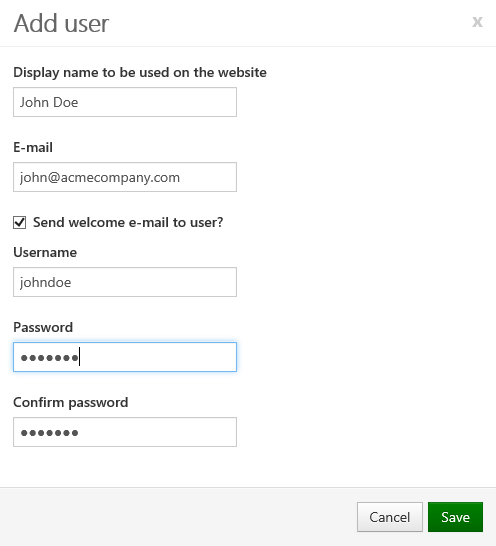 Individual users can be assigned the Administrator or Feed creator role from the user management dashboard. The MyGet Enterprise plan provides support for external authentication modules to sign in to the web application. The users section allows for user management. It is possible to create new users, as well as manage roles, manage quota for a user, send a password reset e-mail or delete a user. Users can be created by clicking the Add a new user button, after which the display name, user name, password and e-mail can be entered. Optionally, a welcome e-mail can be sent to the user as well. When deleting users, it is possible to transfer the user's feeds to a different user. For example when a user leaves the team or company, their account can be deleted and feeds can be transfered to other users within the MyGet Enterprise account. The feeds page allows for basic feed management. It is possible for an administrator to join a feed team as either the owner or as a co-owner. It is possible to enable or disable MyGet Gallery. When enabled, users can enlist their feeds in the gallery and make them discoverable for other users and teams. Feeds that are public will also be discoverable to any user outside the team, while feeds that are visible only to users in the Enterprise account will only show up after login. Optionally, the gallery can also be configured as the default landing page (instead of the login page). MyGet comes with a preconfigured SMTP server for sending out system messages to users and administrators. If it is desired to use a custom SMTP server, it can be configured from this page. Quota for users can be managed individually from the Users page. However, it is possible to configure defaults on the quota page.